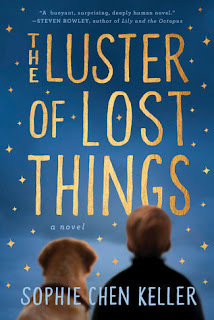 The Luster of Lost Things by Sophie Chen Keller is a very highly recommended whimsical story teeming with feel-good emotions, lyrical writing, and a dash of magical realism. Walter Lavender Jr. is a twelve-year-old boy who lives with his mother, Lucy, above their bakery, The Lavenders. Walter's ability to find things has been developed because he has been silenced by his motor speech disorder. Because he found it impossible to talk, he observed the world around him. "My whole life, my mouth had been shut and my eyes wide open, and the deeper and darker my silence became, the more I began to sense outside of it - traces of light, shifts in matter, changing undercurrents. As I grew older and it became clear to me that Lucy didn’t perceive what I perceived, it was already just another part of me, and there was nothing so incredible about that. The things I noticed were small and fleeting, easy to miss - scratches or flourishes in reality, clues that pointed the way to the larger truths buried beneath the surface, like the molten ripple along the base of a vase of lilies in danger of tipping over or, when it came to people, the disappointed hiss of something doused before it could be said." Walter lost his father, an airline pilot, whose plane went missing three days before he was born. While Walter observations of the world have helped him become a master of finding lost things, he is ultimately hoping to find his lost father. Lucy has told him stories about his father and the connection between them and the book that is proudly displayed in the shop. The book brings magic to their bakery, a bakery where the deserts come alive. You can see vol-au-vent mice jump double dutch with licorice ropes and marzipan dragons breathe fire. Walter's life is happy and safe in his limited world - until someone steals the book, causing the bakery to lose its magic. Walter, along with Milton, his golden retriever, must find the missing book and bring the magic back to the bakery. Walter's search is an archetypal story of a hero on a quest. While seeking the missing book, Walter must leave the safety of his home, go on a long adventure, face adversity, overcome challenges, and return home changed from his journey. As Walter seeks what he has lost, he learns lessons from those he meets. Along with his quest, it also becomes a coming-of-age story for Walter, who makes friends outside of his sheltered home life. This allegorical narrative not only deals with things lost and found, but also deals with our capacity for kindness and how our acts of kindness can ultimately change the lives around us, as well as our own life. The writing is poetic and expressive, capturing descriptions, emotions, and even humor with grace and beauty. 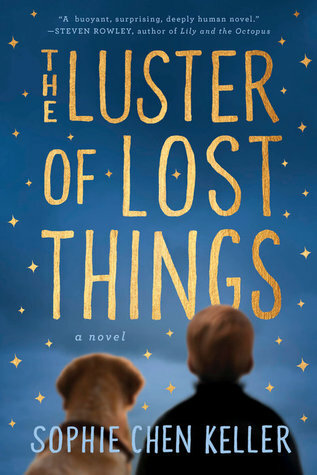 The characters in The Luster of Lost Things are all well-developed. Their descriptions make them all come alive on the page. While I can concede that having twelve-year-old Walter seek out and meet so many strangers on his quest was a bit far-fetched, I must also equally acknowledge that passing many trials is often the case with a hero on a quest. In any event, I liked this story and Walter. I liked Walter's written comments in his notebook along with his observations of the world. The world can always use a good hero story with a touch of magic realism and Sophie Chen Keller has given us just that.